Somalia’s fragile government and institutions, including its national army, are backed by the African Union’s 22,000-strong AMISOM force and powers like the United States. In the meantime, training of the Somali army is handled primarily by foreign powers like the US, Kenya, Great Britain and the United Arab Emirates. About 200 Turkish soldiers and trainers will be stationed at the centre, which is near Mogadishu’s airport. “This academy is quite different because the Turkish will train the forces and equip them with their military hardware so that they will not be left alone after the training”, Somali General Ahmed Mohamed Jimale said during the inauguration ceremony. About 1,500 Somali soldiers can be trained there at a time, making it the largest foreign-run military training centre in the country. 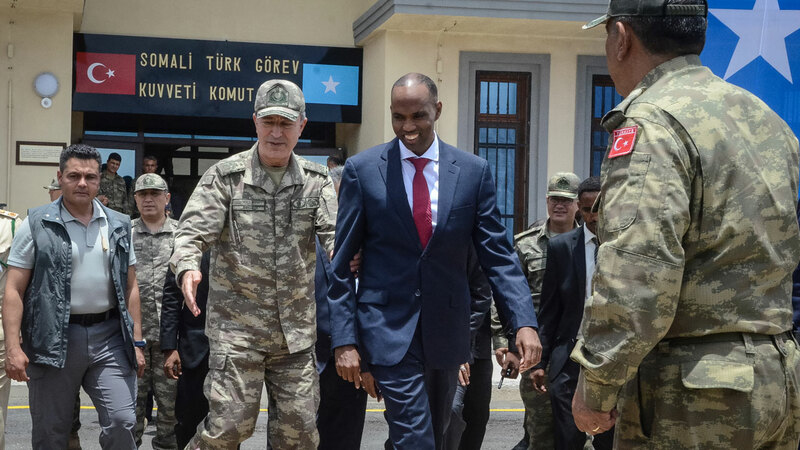 “We thank the Turkish government people and their government for standing up to help our country, this academy is opened at a time when we dearly need it,” Somali Prime Minister Hassan Ali Khaire said. The Shabaab have been fighting to overthrow the internationally backed government in Somalia since 2007. It was pushed out of the capital in August 2011 and lost most of its other bastions in Somalia. But the Shabaab still control vast swathes of countryside, from where they launch guerilla operations and suicide attacks against the capital and against local and international military bases.